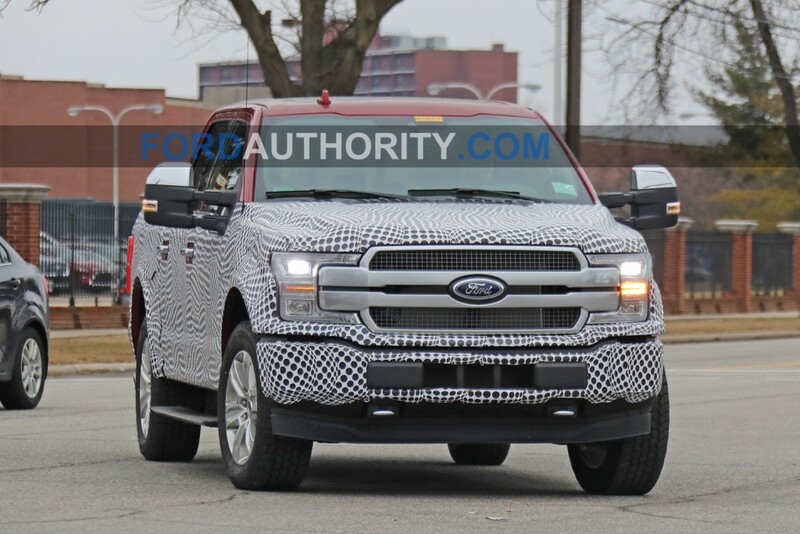 General Motors‘ crosstown rivals in Dearborn are already working on a fully electric Ford F-150 EV, with a prototype for the emissions-free pickup having been recently spotted in Michigan by our sister site, Ford Authority. With the sighting of this prototype, it looks as though Ford is well-ahead of GM with regard to making an electric pickup. This is despite the fact that GM seems keen to introduce more electric vehicles and get the jump on Ford and Fiat Chrysler with regard to alternative energy cars, trucks and SUVs. It’s obvious this Ford F-150 EV prototype is packing an electric powertrain thanks its higher ride height, which helps accommodate the battery pack seen hanging from the truck’s underbelly. A charge port can also be seen on the truck’s front bumper, though this is likely just a temporary location for testing purposes. Oh, and never mind that exhaust tip – Ford’s just trying to fool those of us who don’t know any better. Another interesting part of this truck is the independent rear suspension setup. 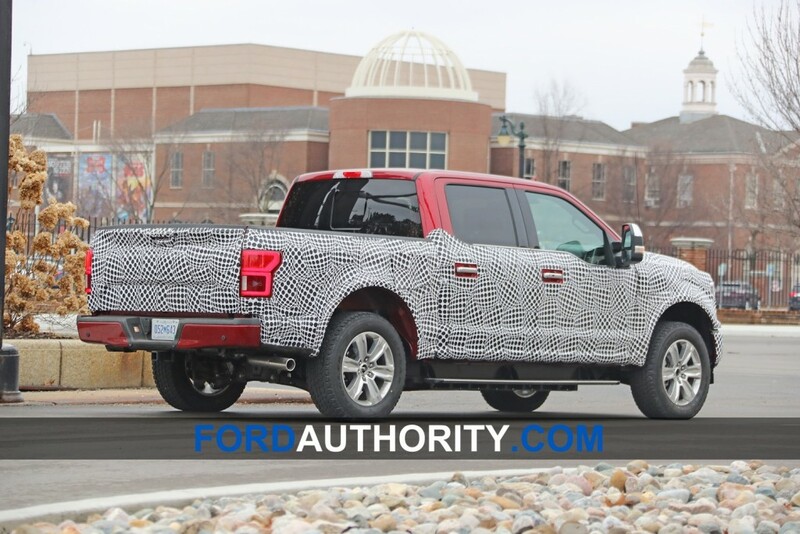 A report recently emerged indicating that certain versions of the next-gen F-150 may feature IRS, and it now seems the fully electric version may be among them. It’s believed that Ford is also planning a plug-in hybrid version the next-gen F-150, so it seems possible that the hybrid could get the IRS rear end as well. While GM may not have an electric Chevrolet Silverado or GMC Sierra in development just yet, the automaker does have a new EV in the pipeline. Little is know about it, but GM claims the vehicle will be based on the Chevrolet Bolt and will be built at its Orion Assembly plant in Michigan. Do you think GM should respond to the Ford F-150 EV with its own fully electric truck? Feel free to let us know in the comments. That is Ford’s product development complex in Dearborn the background in the first and third photos and the Henry Ford Museum in the second photo. Unless Rivian and Ford have ties undisclosed to the public, that’s probably an in-house mule. No mention of Ram beating Ford to the punch, “though not by much” …ooh wait! Back in 2004, General Motors, Daimler/Chrysler and BMW (2005) were set to partner on the develop of the Two-Mode Hybrid system for large rear-wheel drive vehicles. That was before the partners ultimately decided to go their separate ways. So GM became the sole proprietor of the Two-Mode system, …ooh wait! That was GM’s 2nd gen system, coming after GM’s original system known as the Parallel Hybrid Truck or PHT! The Two Mode system was hampered by a small underpowered battery. Since then battery chemistry and cost have improved dramatically. According to their patent application the Two Mode transmission was the forerunner to their Voltec propulsion systems. Because they have the advantage of a much larger battery in a lighter vehicle, the the Voltec systems were able to eliminate the automatic transmission component of the Two Mode and just use two electric motors and one of two planetary gear sets for propulsion. This arrangement could have been scaled up and later with any of the ICEs currently being offered in GM trucks to provide enough power to cover the entire performance envelop using electric power only over a reasonable range of 80-100 miles, enough to cover many commercial applications and commuting for ordinary folks. Anything longer could be handled by the ICE either generating power to operate the electric motors, as in the 1st gen Voltec, or a mixture of power for generation and to drive the wheels as in the second generation Voltec. It’s a shame GM didn’t come out with a PHEV pickup because they had the technology. I think it would have been a great truck, and much more useful than a battery only truck. They could still do it, but they will be at a cost disadvantage to Ford and Ram electrified trucks because GM has already reached its phase out point with the Federal Tax Credit which will probably have dwindled to nothing before Ford and Ram launch their trucks. “Though not by much”, if you know what I mean! Machete Mary loves to hog every camera opportunity she can get (sporting the latest hip teenage fashion) and spews her “Triple Zero” and “All electric” future BS Garbage. Then there is the Jim Hacketts and Mike Manleys of the world. You do not hear from them much (and the former has been raked over the coals) yet it seems that behind the scenes they are working. FCA with new Jeeps, and Ford with their EV pickup and Bronco among others. I would not be surprised to see Ford beat GM to the punch with a wide range of EVs while Barra is sitting in her office trying to figure out who and what to cut for her grand illusion. Miss Mary plays photo op with “minority” women she will soon fire while sporting the latest greatest teen fashion from the 90s…GM meanwhile collapses under her bad decisions, non-decisions and cluelessness. I really struggle to see a market for this. Maybe if it was more a plug-in hybrid type.